I have dedicated my life to studying, working with and enjoying the earth and the hydrological cycle. I believe in constant learning through exploration and experience in the field, the lab and the classroom. I'm eager to share what I've learned so far, and work with students who are as passionate about learning and the world around them as I am. I am interested in hydrologic systems from the local to regional scale, and their role in geologic processes. My area of expertise is isotope hydrology and environmental tracers. I use heat, groundwater age tracers (e.g. CFC's, 3H, 3He, 4He, SF6, 14C), stable and radio-isotopes and noble gas geochemistry combined with numerical modeling and inversion to understand hydrogeologic system dynamics. Please see my CV for selected recent pubs. Outstanding Groundwater Talk. 11th Australasian Environmental Isotope Conference and 4rth Australasian Hydrogeology Research Conference - 2011. Outstanding Groundwater Talk. 10th Australasian Environmental Isotope Conference and 3rd Australasian Hydrogeology Research Conference - 2009. Outstanding PhD Student (Geophysics). University of Utah Department of Geology and Geophysics - 2009. Outstanding Master's Student. 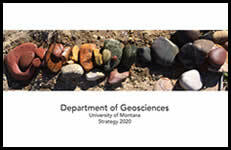 University of Utah Department of Geology and Geophysics - 2007.